Robert Hyde Greg’s Quarrybank Cotton Mill at Styal, Manchester, was described as a model factory. See a night view of the Charles Todd & Higginbotham Mill at Glasgow. Have you traced your family history? Television series like "Who do you think you are?" not only provide insight into the lives of well know personalities, but reveal aspects of social history. For many of us who have come to Australia from the British Isles, our family history will be closely related to the social and economic changes wrought by the Industrial Revolution. When I researched my own family background, I was surprised to find out just how direct a relationship my predecessors had with the Industrial Revolution, particularly the cotton industry, which had a key role in the processes of industrialisation. Robert Higginbotham was born at Stockport, Cheshire in 1768, and his wife, Mary Hill, was born in 1772. They were married at Manchester Cathedral in 1794. They had at least seven children, one of whom was Samuel Higginbotham, born in 1798. Samuel Higginbotham married Mary Anne Edwards of Bowdon, Cheshire in 1821. She was born in 1793, the daughter of Samuel Edwards, cotton spinner, and his wife, Catherine Edwards. Samuel and Mary Anne had four children while they lived in Manchester. They moved to Glasgow in 1829 or 1830. Here they had eight more children from 1830 to 1841. Immediately on moving to Glasgow, Samuel Higginbotham went into partnership with Charles Todd, as Charles Todd & Higginbotham, opening a large cotton mill at Springfield in 1832, later to be resumed for harbour works. The resumption forced their removal to Little Govan. Samuel Higginbotham also founded the firm of Samuel Higginbotham Sons & Company, merchants and calico printers, with works in McNeil Street, Hutchisontown. 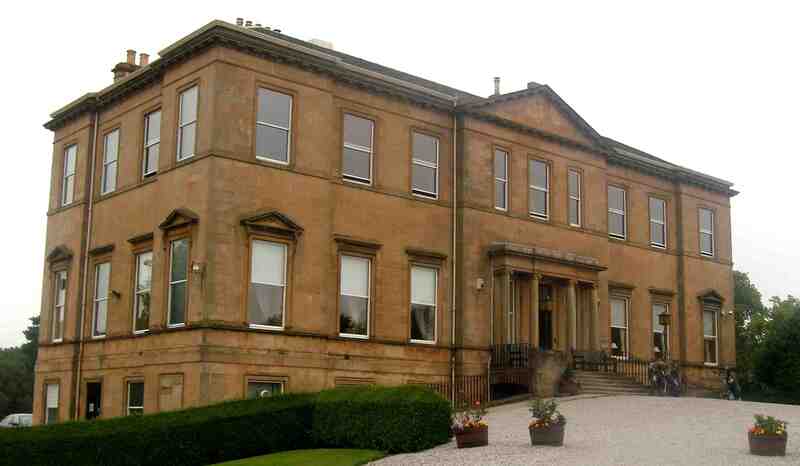 He took his sons, Edwin, John Edwards, Charles Titus and James Samuel Higginbotham into partnership and in the 1861 Census styled himself as "Cotton Spinner, Power Loom Weaver, Calico Printer and Merchant", of Killermont House, New Kilpatrick, Dumbartonshire (now the Glasgow Golf Club). Samuel Higginbotham also ventured into the Turkey red dyeing business with William Miller (1817-1892), who was a merchant and town councillor. Miller had worked for Archibald Orr Ewing & Company, but retired in 1855. The venture, which was undertaken in the 1870s, was a failure. By all accounts Samuel Higginbotham and his sons did extremely well in business. Like other Glasgow merchants and industrialists they were involved in philanthropic work, with one of the Higginbotham wives founding the Glasgow Sick Poor and Private Nursing Association in 1875, maintaining "a staff of highly qualified medical, surgical, fever, and midwifery nurses for nursing patients." Samuel Higginbotham retired from his partnership of Charles Todd & Higginbotham in 1872. He died in 1881, aged 83. "an old and respected citizen of Glasgow, who still survives, and whose family are well known in Glasgow and the west of Scotland"
Killermont House, the residence of Samuel Higginbotham, now Glasgow Golf Course. See a view of the house as it appeared in 1878. Craigmaddie House, the residence of Charles Titus Higginbotham. See a view of the house as it appeared in 1878. "The Houldsworths are one of our few Southron families (the Dixons and Higginbothams are others) who have made their way to the front through the crowd of native competitors." Charles Titus Higginbotham, born in 1834, is my direct ancestor. He married Agnes Ker, from a well-known Scottish family. The couple lived at Craigmaddie House, Baldernock and had three children, Robert Ker, born in 1864, John R. K., born in 1871 and Agnes Cecelia, born in 1877. The firm of S Higginbotham & Company Limited, Calico Printers and Merchants, took over the property and assets of Charles Todd & Higginbotham and S. Higginbotham Sons and Company in 1890, with a capital of £120,000 in shares. This was at the end of the boom times for cotton in Glasgow. The company went into voluntary liquidation between 1897 and 1899 and was sold to the Calico Printers Association Limited of Manchester, England. Robert Ker Higginbotham married Marion Fairrie Newton, with Herbert Charles born in 1894, William Robert Victor in 1897 and Ian Ker in 1898. My father, Charles Edward Ker, was the son of Herbert Charles Higginbotham. By the time my brother and I were born in 1952 and 1954 respectively, the family fortune had long been dispersed through my grandfather's liking for life. Scotland’s People for census returns, births, deaths and marriages.